I’m a migrant. I’ve spent most of my life half a world away from my extended (and sometimes, nuclear) family. 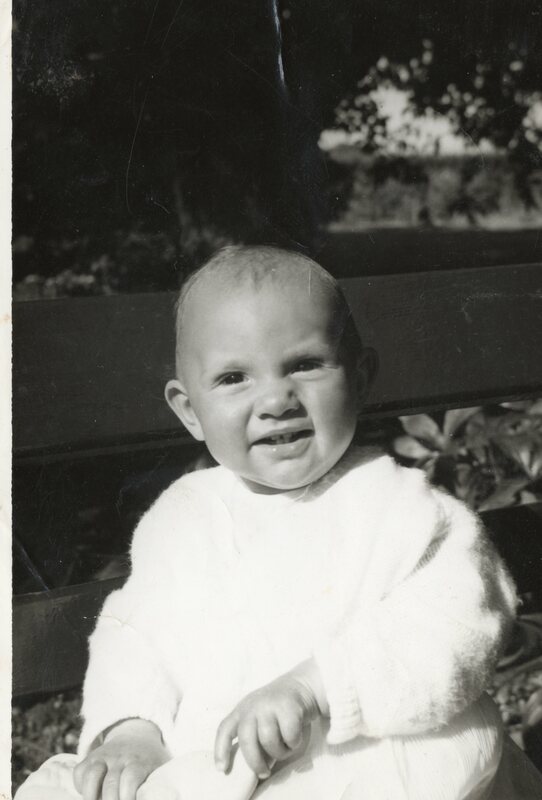 Me, at around 8 months. Cut off from the rhythm and security of the tribe, the clan, the whanau – and without the rituals of Christmases and birthdays that familial ties tend to engender, I also grew up with no real sense of my place in the world, and an overwhelming need to create my own rituals and celebrations. It didn’t help that as well as moving countries, we also moved house regularly and so by the time I dropped out of school three days into the sixth form, I’d lived in about nine different houses in five different locations and was on my sixth school. This isn’t a “poor me” story. I’m a big girl now, responsible for my actions and emotions and for making my own choices. One of those choices has been to research my family’s history. I’m not quite sure quite how it began; and there is probably no single explanation, but a constellation of small things. My grandmother’s death a few years ago severed the last link with a generation, and while I felt I knew her well, I regret I didn’t’ ask her more about her life. 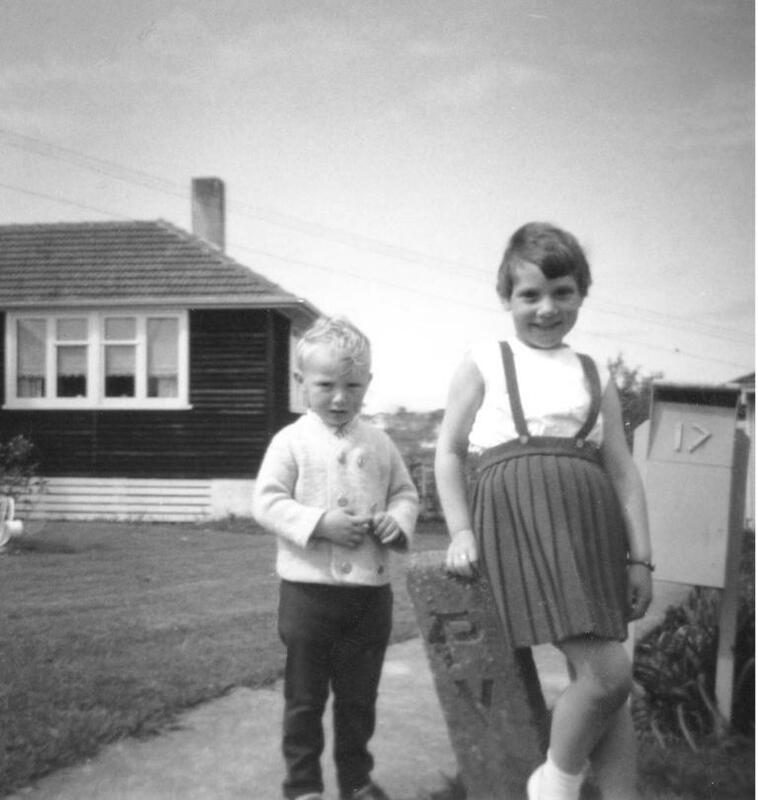 My brother and I outside our first house in New Zealand, probably around 1968. My mother has always been a great storyteller and I rely on her for so much information, but that’s only part of the family and I’m a bit estranged from my dad. Part of it is my age. I noticed when I first got excited about family history and started telling people about it, friends over forty were equally excited and often shared their own stories; the under 40’s kind of glazed over or looked furtively around for the exit. Certainly the fact that I can access so much information on the Internet has had a huge impact. But however I got to this place, I’m happy to be here. I’m excited by the processes – detective work really, and I’m thrilled when I find someone new to add to my tree. And as I’ve written about before, I am happiest of all when I can learn something about the lives of my ancestors – put flesh on their bones. Part of that is my background and education. I have a MA in Sociology and a MIS (Master of Information Studies) in Librarianship. Most of my professional life has involved research and writing in some form or another and the sociologist in me needs social history – “the big picture” that for me gives context to my ancestors’ individual lives. I also enjoy the community of family history researchers – both virtual and physical. I’ve joined the New Zealand Society of Genealogists, and have begun attending the wonderful workshops and seminars run by the librarians at the Auckland Libraries’ Research Centre. Who will comfort the mothers, weeping for their lost sons? 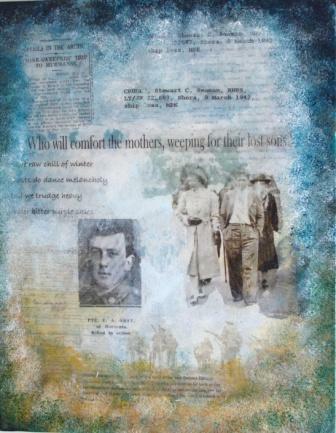 A collage I made based on the stories of two great uncles – one of mine and one of my partner’s. Finding ways to tell my story is an important part of the process. I enjoy words, but I also have a need to make pictures. I’ve tentatively begun to make collages that include images and fragments of text that help me make sense of my past. I want to continue this process. ‘Shaking the Tree’ is important to me. It’s both the record of my work and a conversation I’m having with other people. Some are people I’m related to and who know the characters in my stories and may be inspired to share their own, but there are also many others – you perhaps – who might be interested in your family, and your stories. I won’t get to meet many (any?) of you in person, but I feel I know some of you already from the wonderful, funny, sad and poignant accounts you share of your past and the characters who peopled it. For my mother: a reminder of the strong women who bore us and for whom we were named. I intend to “keep shaking” my tree and sharing the leaves and fruit that fall. Wow! Thank you so much. I’m so pleased you like my blog. Wow; twice in one week. I’m really honoured. Somehow I saw a piece of myself in your story. I am a migrant too. Every year, I have a feeling that soon the tides will move me again where fate destined me to go. Just like you, I wish I asked more my grand parents their stories and more importantly made a record of all if it. It is already too late cause I lost them too. All I have are my memories and what my parents have recounted. This is inspiring, “I intend to “keep shaking” my tree and sharing the leaves and fruit that fall.” We share your dreams my friend. Thanks; hearing from other bloggers and knowing we share similar histories and stories makes blogging so much more enjoyable. Hi Su. Thanks for following my blog. Nice to meet you. It’s one of life’s great quests, isn’t it, searching out our connections. Being something of a prehistorian I tend to delve a little further back than family, and it’s all a bit intangible. It was only as I was reading your ‘about’ that I realised that the poem I’d just posted in the Playing with Space poetry challenge could also be said to be about migration. A love the way one thing leads to another on WordPress. Good luck with your research. your ‘UP’ photo brought me here once I picked up on the NZ connection. I’m 30 years gone from the long white cloud but Maui’s hook is getting stronger. I’ll be interested to follow your journey. BTW I think your blog title is inspired. Thanks! And thank you for following my blog. I’d noticed your Wellington photos, but figured you were UK-based. Maui’s hook for us took the form of a small child that we wanted to give a “Kiwi upbringing”. He’s 15 now and starting to spread his wings. Now the “auld fella” and I are thinking about moving back to England in a few years. Thank you; I’m looking forward to discovering lots of new genealogy blogs. I know; every day I seem to find someone new. Maybe one day I’ll discover someone whose family intersects with mine. You remind me of my daughter – probably the same generation. She also had to put up with frequent moves as a child and through her teenage years. My husband was in the Air Force and we were often posted. And I see you’ve done well with your studies since, as she has. Thank you; and thanks for visiting my blog. We moved, not because of my dad’s job, but because my mum is a gypsy. She’s been back and forth between New Zealand and Scotland, Scotland and England … Even now in her 70s she’d still, deep down, probably like a mobile home (with a driver these days) and no ties to anywhere. True; I think I have it a bit, but I want to travel and come back. The idea of “home” is very important to me. Good luck on your journey; I’m off to Scotland in a few months to do some digging into my roots. 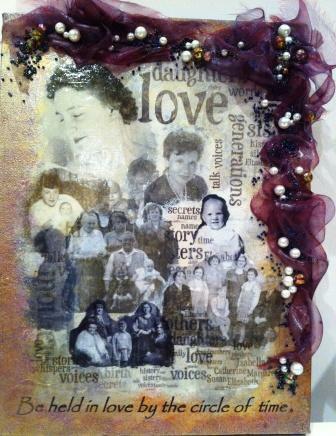 I love your collages reflecting your family history!! I have a bit of a NZ connection–I’m still in touch with the family who hosted me as an exchange student in 1969. We have exchanged visits several times over the years, including my extended family members visiting them in NZ. My sister and I love researching our roots together, and do a genealogy vacation every couple of years if we can. Thank you Sandy; I’m trying to get back into a collage I started ages ago, but I’ve found out a lot more about the people in the meantime and my theme doesn’t seem to work anymore. But I think once I begin throwing some paint around, something will come. Where in NZ did you stay? It’s great that you keep in touch. I’ve got a genealogy holiday planned for later this year and am desperately trying to figure out how I’ll get to all the places I “need” to go in the time available. Thanks for visiting my blog. I haven’t been to Balclutha (shamefaced confession, given how small NZ is). In fact it was only a few years ago I even went to Dunedin! I live in Auckland. The LOR scenery is pretty amazing and I do love the South Island. Author Buzzy Jackson’s story is quite entertaining and informational as well. Have you read it? I haven’t read it; thanks for letting me know about it. And thanks for visiting my blog. I wish you good luck and happy hunting 🙂 I too have been writing family stories and actually self-published stories of my ancestors. Next … me. Thank you. I’d like to publish something about my ancestors – long way to go for me yet though. Thanks for visiting my blog. I just found you because I wanted to see who was reading my stories. I am new to blogging. You are so right about the “glazed over look” that so many have when I discuss my findings. However, I hope that someday some of my descendents would want to know about me. If we don’t dig, then who will ever know our story. Thanks for stopping by and taking the time to comment. I totally agree with you – the research and story-making we do now will be valuable in the future. And in the meantime, blogging about it means we can share with others who “get it” about what we’re doing. That’s my favourite part – so welcome to the gang! What you’re doing is great, the articles the searching ! The pleasure is all mine dear! Thank you. I only wish blogging had been around sooner; it definitely feels like “my” medium. I love the freedom to write about whatever I choose and the sheer democracy of putting it out there to see who will respond and to what. I also love meeting so many wonderful people who also blog. I’m constantly overwhelmed by the kindness bloggers show each other; and – especially in the case of the family history bloggers – the excitement we can feel when one of our number makes a discovery or breaks through a brick wall. I’ve taken to referring to you all as my cyber-whanau (whanau is a Maori word that loosely means family, but encompasses so much more than we traditionally think of as family). Thanks again. reading your blog motivates me to care more about my so I said it is definitely interesting and you’re doing such a great thing! Hi Tish. Thanks for your lovely comment about my blog. What a wonderful, rich story you’ve uncovered. I enjoyed reading it very much and found myself wondering about Giles/Victor and what took him to Australia, only to die much closer to home. ANZAC Day is hugely important to Kiwis and Aussies, so it’s a bit of history we’re taught a little about. Those poor young men were given an impossible task and it’s no wonder so many died. Thanks for visiting my blog and for giving me to opportunity to see this story. I read a story in Sundays Melb Age newspaper about Tina Arena who is a well known singer in Australia. She didn’t move around like you did but she felt that as an adult she was never really accepted in Australia mostly because of its Anglo Saxon dominance. Tina was raised by ;Italian parents in Australia. As with all immigrants there is an enormous disconnect with extended family and then there is the issue of assimilation – or not? In the article she described how France has embraced her talent, she received a high merit award, is a successful singer and how they understand her latin background (unlike Australia). I totally understand and see where she is coming from. The roots are strong. I wonder when it will be that our country is not dominated by one particular culture? Hi Anne. Thanks for your comment; you are right about the huge disconnect and how it affects us. So many of the people I’m meeting doing family history are migrants like me, trying to understand the multiple cultures we spring from. One of the things I like about looking backward at -even my own – history is seeing how much cultures do change over time to embrace new people and ideas. I don’t know about Australia, but I think NZ is much less Anglo Saxon now than it was a few years ago, at least in our informal, lived culture. A good thing, and something I hope we continue to see. I think it will take at least one or two more generations for Australia to accept that someone of asian or european appearance is in fact Australian. We are a multicultural society in Melbourne but there is still a big divide. I remember when Neighbours featured it’s first Italian Australian they overlaid Godfather style music. Anyway I want to leave on a high, it was nice talking and goodluck with your search. I think you are right; and it is probably the same here, particularly with Asian immigrants. I don’t think I’m particularly racist but I’m still sometimes surprised when people of Asian ethnicity have Kiwi accents! I think that’s partly a result of a very large “bulge” in immigration in the last few years. Interestingly, I remember once going through the index of churches in the Melway and marvelling at how many different faiths were represented. It seemed so multicultural compared to NZ. But I guess what we see from the outside is quite different to what we experience living inside a culture. Thanks for stopping by and for your insightful comments. Only just getting into genealogy after discovering that my Great Grandfather left Hull when he was 21 and sailed to Australia…..he was gone almost 30 years and no one in the family knows what happened to him in those intervening years! Will be following your blog to get some research tips as, even though I’ve been a student at UQ for 4 years and I’ve just hopped on Ancestry.com I’m still hitting a lot of dead ends! Hi; thanks for following my blog. Hopefully it will be of some help. When did your great grandfather leave England? I found some records about my great, great grandfather who was a merchant seaman in the 19th century on the NSW government mariners’ records website ( NSW Govt. Mariners’ Records. http://mariners.records.nsw.gov.au). My gg grandfather was a Scotsman who seemed to spend most of his life in the merchant navy. I’ve found accounts of him in Chile and Australia during the 1870s-1880s. By 1891 he was in a lunatic asylum in Fife, Scotland suffering from syphillis he probably contracted while in the navy. He died in the poorhouse in 1903. I hope your great grandfather had a better life. Look forward to hearing about it as your research progresses. PS: best research tip I got (and it’s one we should know from academic study but it’s that bit that’s boring and easy to overlook) – document your sources as you go! Even the dead ends so you don’t have to revisit them next time you dig into that bit of the family! I’m pretty good at documentation as I’ve just finished a 4 year degree in Lit and History, my rellie dosent have an intial and has a very common surname so I’ve been down a lot of rabbit holes! At the moment I’m working backwards again because he did return to Hull, cashed up and married very quickly. It’s the decades he was away that no one knows anything about! I think I definitely have him on a ship list/immigration into Australia but he’s listed as an able bodied seaman. Some one has suggested that it might not have been his profession but a way to get a ships passage instead. The only other evidence that he even came here is that he wrote a letter to his sister saying he was emigrating to QLD – the record I have has an arrival in Brisbane, but then sailed on to NSW, then I think I have the right Taylor on an Australian census for 1891 on the Gold fields…..which might explain some of the cash! But its still a bit of a dead end as I can’t find anything for him emigrating back to the UK! ..Hadn’t quite finished there, hit the wrong button..
“growing up without the internet” is how it ended. I enjoyed reading your about page very much. I think we all want to leave our fingerprint with those who are close to us. Elders years ago rarely spoke of family things. I suppose it’s the reason why many people are researching their geneology and writing their memoirs. Everyone has a story. We all want to be counted in the world of humaness. Good Wishes for your journey to discovery. Thank you for visiting my blog and for your lovely comments and good wishes. Su. You’re welcome: I really liked your post. Got me thinking! Hi Su, thanks for stopping by our blog and liking our chicken wing post. We greatly appreciate it! You have some very amazing pictures! You are very welcome; I really like some of the recipes on your blog, and am keen to try them out of the holidays. Thanks for stopping by and taking the time to comment. Really nice and interesting to get to know you so to speak. Merry chistmas from the westcoast in Sweden. Hi Su, nice to know about you. Nice title’ Shaking the tree’. Thank you Indira; for your kind comment and also for following my blog. It’s very true, we get more interested in our roots as we get older, and I also wish I knew more about, and asked more questions, when my grandparents were alive, ask as much as you can about your relatives while they are still around. Thanks Joan. This is a sentiment I am hearing so much. I’m determined to do something about it – not only with what’s left of my family but also to maybe create a project to collect other people’s family history stories. It’s so much easier these days with smart phones!!!! Thank you for visiting. You are welcome, I like reading stories from the past. Glad to be a member of the clan! Amazing how strongly you feel the need to find out the deep,deep roots of your family.As a sociologist you know better than anybody else the real value of family.Can’t imagine how societies would be without the institution of the family.One feels really empty when they ignore the history of their ancestors.Even ignoring the history of your country makes you feel a foreign body in society. Wish you the best of best and good luck.I’m certain sure one day you’ll know every little detail concerning your ancestors. Thank you Doda. My appreciation of family – both as a concept and my actual flesh-and-blood has taken a long time to emerge. I regret that I wasn’t more interested while my grandmother was still alive, but am grateful for the renewed and strengthened connection that my “digging” has given me with my parents. It’s also helped me find some brand new (sometimes quite distant) relatives and let me experience the joy of an ever-expanding family. I very well know the feeling,Sue.Keep triumphantly going !!! Oh my word! Now my interest is rekindled. It helps to have Scottish ancestors. The Scottish government has done a wonderful job preserving documentary heritage (guess it’s worth many, many tourist $$s). I really love your blog. My paternal great grandfathers side (McHargue) have a very thorough tracking back to the 4th century I believe. Thank you! Have fun. I’ll be reading your results. Have a great day! I am so touched by your search and the fabulous creativity it has triggered in you. Nice to meet another so passionate about family history. I have researched mine and found relies in New Zealand Australia and Denmark. Thanks for the pingback on the phoneography challenge. The drive you describe to dig is indescribable to others… It can only be explained in your own heart, yes? I hope you still have the time to document – time really flies. 🙂 that’s so true. I go through phases of just wanting to know more, and others of wanting to write about what I know. The trick (and I haven’t found it yet) is to balance them, so I document and describe as I go; which would save me loads of effort but just doesn’t fit with the flow of the passion. You’re welcome 🙂 Cheers, Su. Hello,I saw you mentioned David Skinner Ramsay married Mary Fisher. I know that his ancestor was Capt.James Low of Madras Native Infantry.I do have a lots information about your ancestor,Capt.James Low in Penang. This is such an amazing project/passion. I wish I had asked my grandparents, and my father, more about my family history. I know very little and that saddens me because lately I’ve felt a need to connect with my roots. Collaging is a wonderful way to express yourself and I find your blog really inspirational! thank you for your kind comments on mine and although our journeys may seem different, I think we’re actually alike because to me we’re both on a quest to find out who we are and where we came from. Hiya Su. Thanks for following my blog. I’m also a drifting drop out. I completely get it. Thanks. Love the title and concept of your blog. Definitely one to keep following. Regards from Thom at the immortal jukebox (give it a spin). Thank you; not sure it’s in quite the same league as the immortal jukebox though – or even my other blog zimmerbitch (and I did think twice about that shameless piece of self-promotion). Thanks very much. Promotion always fine! Regards Thom. Hope you keep coming back to the jukebox. Definitely; but we may have to agree to disagree on Van! I laughed our loud–your comment about the under 40’s is so very true! We’re on a similar quest, so I’m so very happy to have discovered your blog. If you have a moment, check out my July 4th post, which features our fabulous Half Moon Bay librarians. Wow! Librarians are so much cooler now than when I was a kid! Hi Su, so there I was, skiing the interweb, bored, then remembered my daughter, Melany saying, put your name into Google and see what happens.So I did. Imagine my disbelief upon seeing my Gran and Grandad, Kate and auld Eck staring back at me. It would seem you’re gran was my aunty Maggie. My dad was George Alexander, I am George David Cruden. I had a free trip down memory lane for which I am so grateful. Kate was indeed indefatigable. The baby she raised after the breakup of his parents was in fact me. The picture of you,your mum,gran,Kate and Eck was taken in the back garden of 15 Pottery Street in the Gallatown, pronounced Galltin,with a soft ‘t’.The shed in the background housed grandad’s mobility mini,pale blue, and lots of stuff. It also doubled up as my gang hut. Among their many business interests such as the pub in the Milton,chip shop etc.was the Harbour Hotel at the foot of The Path in Kirkcaldy where I grew up and discovered that I too have that wanderlust gene. A few weeks ago I was contacted by one Liz Mansfield who it turned out is my cousin, her father being my uncle Sandy, Maggie’s brother. You probably know she lives in Australia.There’s certainly something in this synchronicity malarkey. I sincerely hope you and yours are just dandyho. If I can fill in any details please just get in touch. I’ve been living in Houston Renfrewshire for the last 20 years and I still have itchy feet. Hi George. Thanks so much for getting in touch; it’s brilliant to hear from you. I have memories of going to Pottery Street in the mid 60’s – before my parents moved to NZ. I’ve been in touch with Lorraine and she’s shared some brilliant photos on FaceBook. Your grandad was really special to my mum; she always talked about him a lot, and I know so little about him and great gran. My told me about the chip shop and the pub (and in fact I went there last year when I was back in the UK on holiday), and Mum talked about living at the Harbour Hotel (although I may have that wrong). Did they run it as a hotel? I only got to know my gran when I lived in the UK in the 90s, and although I spent lots of time with her and my Auntie Cath, I didn’t ask all the questions I have now, because they didn’t occur to me then. I remember your cousin Liz; she came to stay with us in NZ when I was a kid. She brought her daughters Mandy and Trish who’re around the same age as my brother Craig and me. I’ve met Mandy again as an adult when we visited your cousin Sandy’ ex, Edna and her daughters in Melbourne. They’d also visited us in NZ and we’d met up again when they were in the UK one time and I’d just gone to live there. Edna and Sandy have a grandson called Jonathan who is a day younger than my son, and we have this lovely photos of “all the girls” (Edna, my mum, Valerie, Carolyn, Mandy and me) with our two little boys both descended from a single set of great great grandparents. I wonder if the itchy feet is a family trait? Mum’s terrible at not staying put – while my dad is much more settled. I grew up mainly in NZ, but spent nine years back in the UK. Now my son’s about to finish school, we’re thinking of moving again. Part of my would like to live in Scotland again – I loved being back last year – but there’s a big part of me that’s Kiwi now too. I’m bound to think of plenty of questions once I’ve signed off from this (it’s always the way), but I do have one question now. Do you know anything about your grandad’s older sister? Her name was Jane (Jean) Morrison Cruden. She was born in 1887 (three years before great grandad). After the 1901 census, she seems to disappear a bit from the record. I think I found a marriage for her in 1924 in Middlesburgh (based partly on the name of the child from that marriage), but nothing more and English records aren’t as easily accessible as Scottish ones. My mum didn’t know anything about her. Also, would you mind me adding you to the family tree. Because I don’t really know the living family well, I’ve got big gaps in the generations 1-2 before me because the records aren’t available and I just don’t know who to ask. I don’t even know your dad’s birth year? Anyway, I’ll stop blethering on. It is lovely to hear from you. Hopefully we can stay in touch. Cheers, Su. Hi Sue, apologies for the delay in getting back to you. Of course you can add me and mine to ‘the list’. Your research has provided me with some really interesting reading. The revelation that granny used to go to work on the back of a motorbike explains a lot. I think uncle Jim was a despatch rider during the war, my old dad built specials, aka bitsas, both my brothers had bikes and I am the ageing hippy with the long hair, tattoos, and I will never give up my bike. There’s a company here that specializes in bike tours to New Zealand which I’ve looked at, maybe an excuse to look again, how cool would that be? Hi George. No problem! It was mum that told me about great gran on the bike. I never knew her well, but I don’t have any trouble believing it. I knew your dad was a mechanic — he kept my mum’s car on the road long past it’s use-by date!! My partner has a Katana he’s owned for about 30 years; recently repaired after years in his parents garage. He’s just bought another one, slightly newer model. Boys and bikes …. NZ’s a pretty good place to ride and there are quite a few organised events too. A friend of ours writes for Kiwi Rider (think that’s the name) and he’s always turning up with some bike he’s “testing” for an article!!!! Have you beeen to NZ before? Your Uncle Jim came and visited Mum and Dad once, must have been the early 80’s I guess. Will email you with questions about the family tree stuff when I get a minute. It is really cool to hear from you. Hi, I just wanted to let you know that I nominated you for the One Lovely Blog Award. I really enjoy your blog and find it both helpful and interesting. I’ve learned a great deal from your writing, research techniques and insights. I love how you tell a story! Thank you for telling us so much about yourself and your families. You have given me inspiration to just get on with it all. The researching, writing, and most of all the sharing of photos, stories and family heirlooms. Hi Nola; thank you for visiting and commenting on this page. I’m glad if my words inspire you to research, write and share your stories. I really believe that — especially in an age where we often live so far away from members of our family — it is really important to collect and share our stories so that they aren’t lost, and to help remind us that we belong to a great extended whanau that stretches back — and forward — in time. Hello! Found my way here via a circuitous route (all blogs must link up in the end – some variation of the six degrees of separation thing). I’m much more interested in my family history than I used to be, though my activity has been mainly sorting out what we have than any actual research – as well as persuading my mum to write her memoirs so that all her stories are not lost. John has also recently become interested in his family tree, so maybe when he retires (if ever) we’ll take it up more seriously. Hi Anabel. I decided a while ago that 40 is the magic number for family history interest. When I first started researching and being so enthusiastic I had to share my discoveries with everyone, I found that friends over 40 were interested, and usually had their own stories to share. Those under 40 just glazed over! Blogging has been really helpful to me; I’ve had quite a few distant relatives get in touch, and also people with quite unexpected connections to my stories — like the great grandson of the doctor who delivered my great grand aunt’s stillborn daughter. Yes, I was probably in my 40s when I started being interested! We’ve also had emails from distant connections both through me doing an online tree and my Mum’s blog. There was a surprise for us (descendants of an illegitimate child of my dad’s grandmother) and for others – a woman whose great-grandfather was one of my mum’s uncles. He and her great-grandmother, whom she had known, had split up but she couldn’t accept that even though my mum was a living witness. And indeed, we have his death certificate because my grandfather arranged his funeral as all his family had moved south with his wife. So an open mind is essential! I’ve thought a lot about handling and sharing the surprise discoveries. My mum has been my main source of information to begin research, but a lot of what I’ve found has contradicted what she has believed. She’s been quite good about it, but I suspect if my grandmother had still been alive, it might have been a different matter! It sometimes depends what age you learn it – my mum believed the uncle who left his wife lived with a housekeeper, because that’s what she was told as a child. When she was an adult she worked that one out! That’s so true. My mum said her mother told her that the aunt I mentioned who’d died in childbirth had died of a broken heart. My grandmother was 13 when her aunt died, and because the aunt wasn’t much older, they’d been like sisters apparently. I wonder if my grandmother knew her aunt was pregnant at the time? She was very concerned all her life to “keep up appearances”, so I can’t imagine her letting on the truth. But I suppose she must have known it, or at least figured it out as she got older. Hi Sarah. I’m so glad you like it. Family history is my not so secret obsession (besides art, coffee and stopping bugs from eating the Cavolo Nero in my garden). I’m fascinated by how others become interested in their own families and the joy people get from sharing their stories. The Huguenots suffered terrible persecution and became really widely dispersed. In Dublin there is a little Huguenot cemetery on/near St Stephen’s Green. I was originally surprised to find it in such a strongly Catholic country, but I gather that the English rulers of Ireland at the time we’re welcoming, and it seems that the refugees were welcomed and their skills greatly appreciated. Would that we could say that today. Hi Su! Sadly my aunt stopped her research when her second child arrived and hasn´t found the energy to pursue it further since then. What´s funny is that she chose to research her husbands family (he´s my mom´s brother) instead of her own. We are very grateful for everything she found out so far as most people seem only to know about their family til their grandparents. I wished I could have questioned my maternal grandparents for more details though, but as you know they died when I was too young to have such interests. It´s sad how this knowledge can be so quickly lost. I know what you mean about feeling you’ve missed an opportunity with older relatives. I knew my grandmother really well, but still never asked her much about her life. I get information from my mum, but often find that her version of events isn’t very accurate. I didn’t know much about the Huguenots until I lived in England. The English textile industry got a huge boost from Huguenot immigration, and I found out that they migrated as far as the US and South Africa. It is terrible that new immigrants have to work so hard for acceptance, but it is human nature I guess to be a bit mistrustful of difference. I get so angry at how easily people forget the huge contributions of migrant groups; whether it is in doing the low-paid jobs that locals don’t want, or in bringing new skills and ideas. My parents immigrated to NZ with my brother and I, and it was a decision that allowed them to own a house, educate their kids (including university which was free in those days). My dad and I are the only ones still in NZ and we remember and appreciate this country’s generosity and welcome of my family. I wish we were a more welcoming, generous society today. That´s exactly it! There´s a lot to gain from migrants for any society. The last “wave” here in Germany was in the late 60s and early 70s when many people from Turkey arrived here and did those low-paid jobs no one here around wanted to do anymore. Then Germans were thankful and happy for them. 20 t0 30 years later that changed when the kids of those migrants tried to get a job here, too! Of course, most of them are german themselves being born here but differences in names and appearance clearly stated them as “foreign”. I´m meeting the same prejudices (my mom is german, but my dad is egyptian) and it really is not funny, especially since I don´t speak a single word arabic (he was too busy working at that time). I think many germans emigrated to NZ too – and still do, though it seems to get harder to do so now. Times clearly have changed – both for the worse and the better. Hopefully the latter will prevail someday! I hope so too, but I’ve just been reading about the rise of racially-motivated attacks in the UK since Brexit and I am even more saddened than I thought I could be. Yes; I think many people voted to leave just to register a protest with “the system”, thinking their vote wouldn’t count. It’s sad that people become so alienated from the political system that to do so seemed like a good idea. I have pro-Brexit family members and it’s pretty horrible when issues split families. In NZ the 1981 Springbok Tour (South Africa’s rugby team visited NZ to play), split the country into those like me who saw it as endorsing apartheid and protested, and those who said “keep politics out of sport.” The Falklands War split my family too. The coming months will be really interesting, but scary too. I couldn´t agree more! It has become a sad fact that most people are not as familiar with their own country´s politics as they used to be. Although access to it has become so much easier nowadays! I know how you feel. It’s hard not to see the rise in racially-motivated attacks in the UK as just more evidence that the “leavers” were motivated not by intelligent, reasoned understanding, but by racism and fear. Meanwhile, in my country, families continue to live in their cars because housing has become so expensive and despite official statistics showing an increase in the gap between rich and poor, the government continues to deny there are any problems. It’s like we’re being led by a bunch of people walking around with their fingers in their ears, humming loudly to drown out the sounds of protest. And our mainstream media let them get away with it. Aaagh! I didn´t know that about New Zealand! That sounds so terrible!! It´s not exactly the same case here in Germany, but the gap between the poor and the rich is also increasing very much and there´s no end. It´s awfully difficult to get a job – even a badly paid one! Having an university education doesn´t help anymore either as I´ve learned the hard way 😦 There´s something gone terribly wrong and the picture you painted with your words about those people sticking their fingers in their ears and singing la-la-la is so absolutely right! It could be funny if it were not so serious… I understand that you´ve got a degree in politics (facebook) so your insight in all this must even be more frightening than it is already to me! No need to apologize, Su! I love discussing these things too! 🙂 And you´re absolutely right – tertiary education really has become just another business it seems 😦 I presently am in the process of considering writing a doctoral thesis just to increase my chances at getting a job, the problem is though that everyone seems to do this nowadays and it could well be that the time I invest doing this (which will be a couple of years surely) is yet another misspent… I would much prefer getting a nice job without that! Aarrgh!! P.S. Followed your link to those great recipes by Hugh Fearnley-Whittingstall and they are just amazing!! Going to try out some of these in the next weeks!! 😉 Thank you! That´s the best way to do it, I think. I made my master two years ago and fear I might be slightly out of touch with my academic writing style… But then I was hoping to get a job as a scientific assistant that would include me writing the thesis. Now I´ve come to realize that also seems to be part of the past as museums and universities require for you having made you thesis already before! I´ve got some ideas on what it could be, but they are not fully developed. I love architecture and wrote my master about Norman Foster´s Gherkin and other related buildings in Europe, so it might well be that I would write about architecture again. But I also like paintings very much and there´s always a lot to theorize about those, so maybe it´s going to be that way? I still am not sure and need to do some research before presenting my idea to a professor. This already will take a while! And I am aware that writing it will at least take up 2-4 years when I´m lucky! Haha! If I had lots of money I would exactly do the same!! 🙂 I just love to learn!! Ah, great minds think alike! I have a friend who switched her academic interests from rural sociology to international tourism so she could do more interesting “fieldwork.” Let’s just say she is an inspiration to me 😃 I think multi-disciplinary work is so much richer than research that stays within one area, with all the dogma and personalities and theoretical fashions that take hold in each sphere of academia. Are you interested in sustainability; because there are so many areas around aesthetics and public perception with regard to sustainable and green buildings — and that definitely has global research potential. I totally agree with you! I´m interested in so many different things and that was well reflected in my studies 😉 Your friend´s switch sounds absolutely fascinating! So it´s possible to improve one´s research habits over time 😉 Good to know! I was hoping it would be. I know what you mean about choosing a topic that doesn’t really make your heart sing. I wasted a year of my MA on a thesis topic that, in hindsight, was laughably inappropriate to my interests. I made absolutely no progress whatsoever. Oh no! That sounds terrible! Well, I tried a different subject as well before, luckily it only took me three months to see that it wouldn´t work! Forgot to say; I love that you’re going to scan the family photos. It is a huge job, but really worthwhile. Wow; that is a lot of photos. I have about 100 “heritage” photos that my parents have given me. These date I guess from the 1970s back to about 1911. The Big T’s family has some older than that; really formal studio portraits taken in Germany probably in the 1880s — we know the place from the photographer’s Mark, roughly the date — but we don’t know who the people are. It rather is a large collection, though unfortunately I don´t know most people that are shown there and they often lack descriptions and dates on the back.